There’s a pretty cool webpage that shows this bands tour locations on a map here.Â After watching this for a while I decided these guys are “tour fools”.Â Not sure if the jag off to Peru is a mistake but even without that sidetrip, they are frantically peforming all up and down both coasts.Â Â Lucky for us, they’re stopping off in Missula tonight. 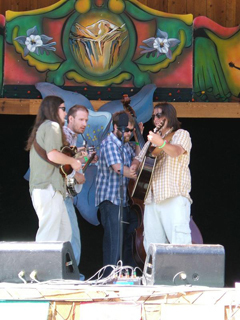 This entry was posted in Events and tagged elks, greensky bluegrass by Phyllis Erck. Bookmark the permalink.